Preschool is a class which offers positive learning experiences through a child-centered curriculum. Full of skills, energy and imagination, these children are continually learning by interacting with each other and with their environment. Through a play-based curriculum that meets the individual needs of each child, the children in our program are free to master new knowledge at their own rate and in their own way. This enables them to organize their experiences and to make sense of their world. These goals are accomplished by offering developmentally appropriate activities for the children through a curriculum of hands-on learning experiences. These experiences contribute to the development of the physical, social, emotional and intellectual needs of the whole child. The children are beginning to make age-appropriate choices which foster their independence. They are continually gathering information in an effort to interpret what they are learning. Play is very important - it is how they process information, make it meaningful, and learn new things. All children are assessed using a revised edition of the Creative Curriculum Assessment system. These assessments take place twice a year. After each assessment, the results are shared with the family during a conference. Families are encouraged to continue the children’s learning activities in the home with stories, outings, songs, and helping around the house to teach important skills. Assessments are then used in program planning to assure optimum developmental growth of each child. Water Play: A favorite as it allows full exploration of their fine motor skills and sensory experience. Their pouring skills are more finely brought out by the various stacking and exchanging of water into different containers. It increases their vocabulary as they discuss with the other children what they are doing. Block Building: Their approach to block building is with the beginnings of building structures incorporating other play using large and small motor skills such as building road ways, pushing cars and trucks. Dramatic Play: This area is great for almost all of the areas of development. 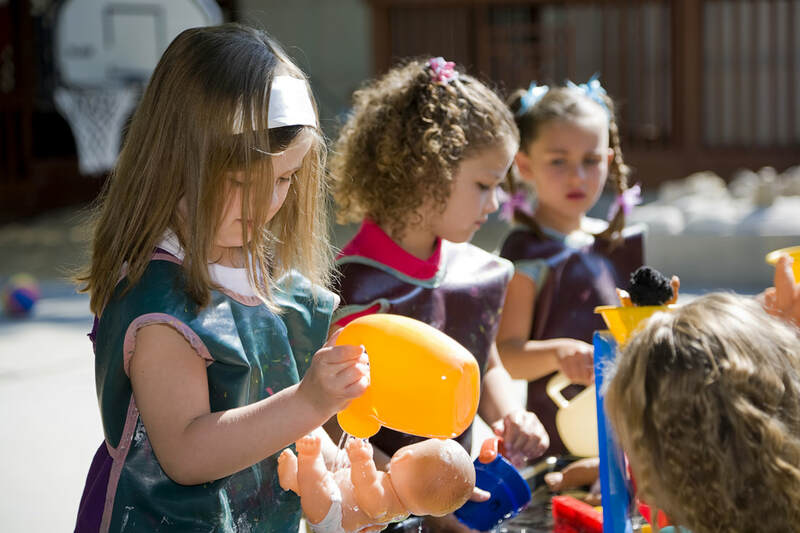 It encourages social development, helps them to sort emotions as they play out various roles, and promotes fine and gross motor skills as they put on the clothes, hats and shoes, and dress up dolls. Art: Gluing, pasting, cutting, tearing, and painting is a favorite as it fulfills the small motor development, and allows the children to express themselves creatively. Their work is with concentration and precision, and they display pride in their product. Music: Preschoolers are less inhibited in joining in the group singing, dancing, and repeating favorite rhymes. They can easily repeat songs, and enjoy experimenting with musical instruments. Providing this encourages interest and exploration.